I welcomed around 175 delegates from 23 countries to Cape Town this morning, numbers considerably lower than at Comminution '14 due to the dire state of the industry at present. The day's technical sessions got off to a fine start with a keynote lecture from Joe Pease, of Mineralurgy Pty Ltd, Australia, and Chairman of the conference's Industry Advocate, the Coalition for Eco-Efficient Comminution. I will not summarise the day's technical sessions here, as I will report on these in my conference diary, scheduled for April 25th. 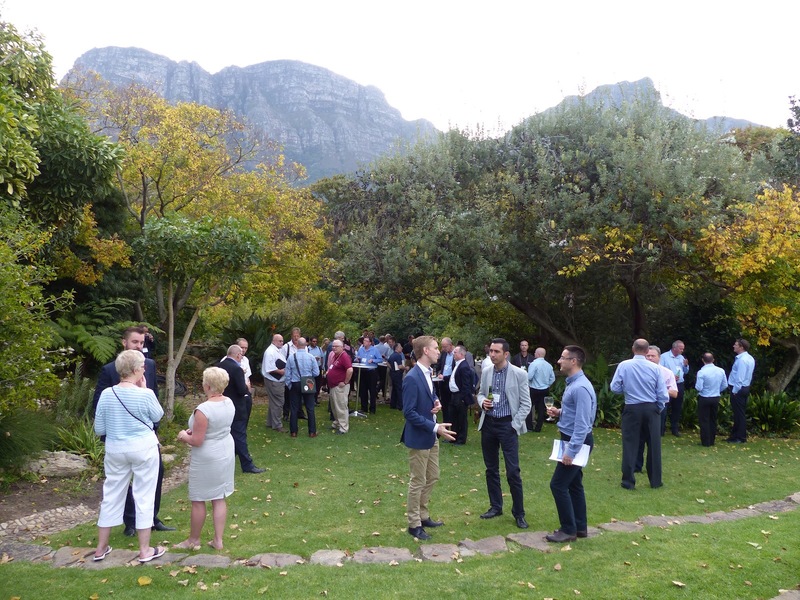 The first day is a day for people to get to know each other, during the long coffee and lunch breaks, and the first of our 'Happy Hours' in the hotel gardens at the end of the day. Joe Felix of CiDRA, is a very familiar face, attending his 7th MEI conference. 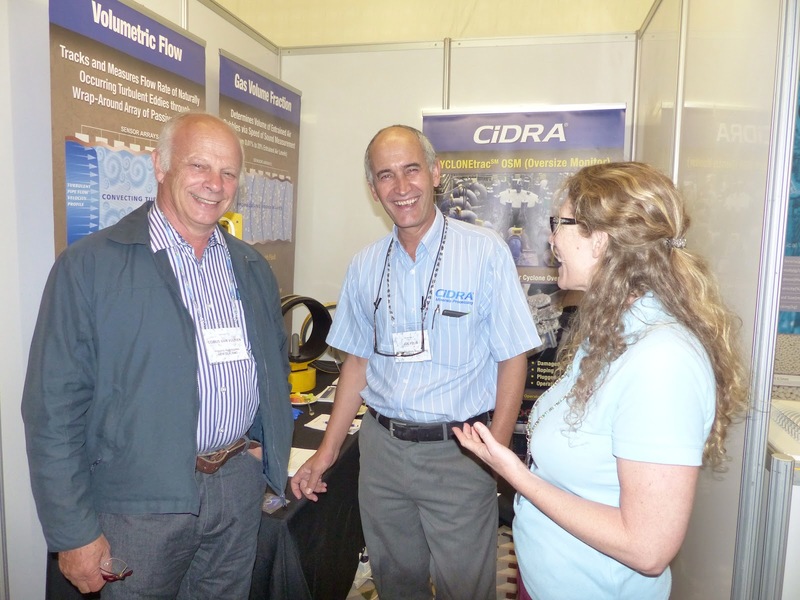 CiDRA Minerals Processing, USA, a regular at MEI's Cape Town conferences, particularly the flotation series, is a supplier of process optimization products including non-contact systems capable of providing multi-variable measurements, such as volumetric flow and entrained air. 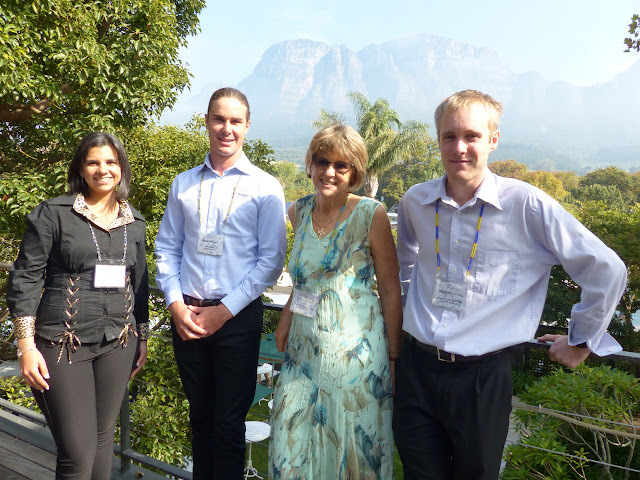 Leon Venter and Quentin de Jager, are representing Crush Force, a South African company attending and sponsoring an MEI Conference for the first time. They are promoting a radically new energy efficient and cost effective development in cone crusher design, departing from the traditional stationary concave and moving mantle. They told me that the new development removes the complex drive systems entering the machine from the bottom and offers a simpler more robust solution and due to the higher pressures and greater range of movement possible in the crushing chamber of this design many options are opened up that are not available on traditional designs. Reduction ratios are much higher which opens up a vast field of applications that could never be achieved with cone crushers before. 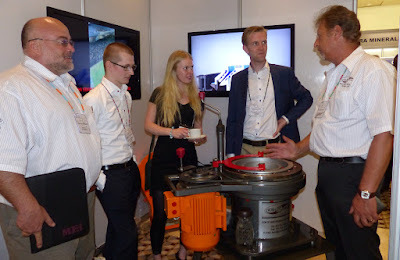 This was obviously of great interest to some of the 10 representatives from Chalmers University, Sweden, who have a keen interest in cone crushing. There was a mini Camborne School of Mines reunion at the Happy Hour, when we were joined by Gaynor Yorath from nearby University of Cape Town. 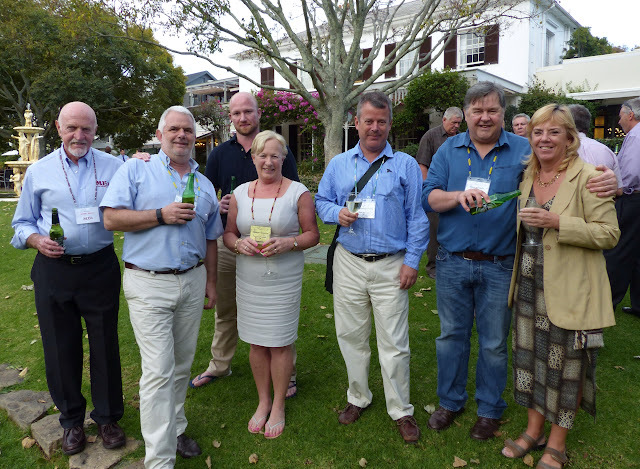 Pictured below are me (lecturer 1974-1996), Nick Wilshaw (1980 BEng), Simon Bailey (MSc 2007), Felicity Wilshaw (secretarial staff) now Grinding Solutions Ltd, UK, Andy Wilkinson (BEng 1991), now with Metso, UK, Paul Morgan (BEng 1985), now with DRA Global, based in Scotland, and Gaynor (1995). 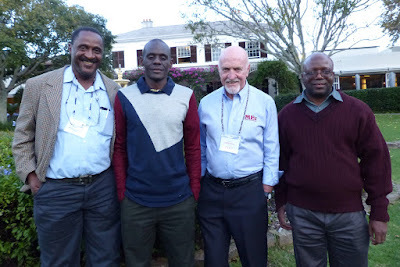 Also at the Happy Hour I talked to the three representatives from Mopani Copper Mines in Zambia. Only last week Glencore announced plans to invest more than $1.1 billion in its Mopani copper complex in Zambia over the next two years. The investment marks a positive turnaround for the mine and Zambia’s entire copper sector, which has been stagnating following a sharp decline in copper prices and severe electricity shortages since 2015. It will be interesting to hear more about Crush Force - "radically new energy efficient and cost effective development in cone crusher design, departing from the traditional stationary concave and moving mantle. They told me that the new development removes the complex drive systems entering the machine from the bottom and offers a simpler more robust solution and due to the higher pressures and greater range of movement possible in the crushing chamber of this design many options are opened up that are not available on traditional designs. Reduction ratios are much higher which opens up a vast field of applications that could never be achieved with cone crushers before"